For courses in Introduction to the Bible, Biblical Literature, and Christianity in the department of religion, and for use as a basic text in the formal study of theology in the seminary. This text is a compact commentary on the entire Bible, written by Roman Catholic scholars according to the principles of modern biblical criticism. Verse by verse, it examines the scientific, literary, and historical content of the Scriptures—reflecting the exegetical variation found within the community of scholars. Two types of articles—Topical and commentary. More than 20 articles of an introductory nature—e.g., articles on Jesus; the Early Church; and the subapostolic church. Contemporary theories—On dating; historical reconstruction; and archaeological information. Contemporary perspective on Hermeneutics—(Art. 71). Focus on the Old Testament. Chapter-and-verse enumeration—Follows the original language patterns, even in those books where the versions differ. Boldface marginal numbers—Identifies all 83 articles and then breaks them down into numbered sections. Foreword to The New Jerome Biblical Commentary, Carlo Maria Cardinal Martini, S.J. 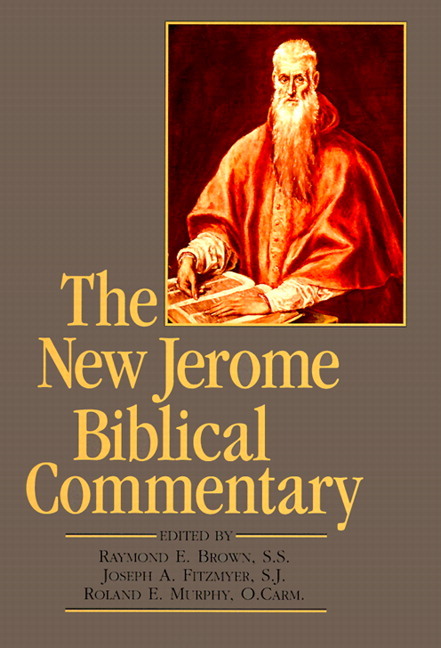 Foreword to The Jerome Biblical Commentary (1968), Augustin Cardinal Bea, S.J. 1. Introduction to the Pentateuch, Roland E. Murphy, O.Carm. 2. Genesis, Richard J. Clifford, S.J. ; Roland E. Murphy, O.Carm. 3. Exodus, Richard J. Clifford, S.J. 4. Leviticus, Roland J. Faley, T.O.R. 5. Numbers, Conrad E. L'Heureux. 7. Joshua, Michael David Coogan. 9. 1-2 Samuel, Antony F. Campbell, S.J. ; James W. Flanagan. 10. 1-2 Kings, Jerome T. Walsh; Christopher T. Begg. 11. Introduction to Prophetic Literature, Bruce Vawter, C.M. 12. Hebrew Poetry, Aloysius Fitzgerald, F.S.C. 13. Amos, Michael L. Barré, S.S.
14. Hosea, Dennis J. McCarthy, S.J. ; Roland E. Murphy, O.Carm. 15. Isaiah 1-39, Joseph Jensen, O.S.B. ; William H. Irwin, C.S.B. 16. Micah, Léo Laberge, O.M.I. 17. Zephaniah, Nahum, Habakkuk, Thomas P. Wahl, O.S.B. ; Irene Nowell, O.S.B. ; Anthony R. Ceresko, O.S.F.S. 18. Jeremiah, Guy P. Couturier, C.S.C. 19. Old Testament Apocalypticism and Eschatology, John J. Collins. 20. Ezekiel, Lawrence Boadt, C.S.P. 21. Deutero-Isaiah and Trito-Isaiah, Carroll Stuhlmueller, C.P. 22. Haggai, Zechariah, Malachi, Aelred Cody, O.S.B. 23. The Chronicler: 1-2 Chronicles, Ezra, Nehemiah, Robert North, S.J. 24. Joel, Obadiah, Elias D. Mallon. 25. Daniel, Louis F. Hartman, C.SS.R. ; Alexander A. Di Lella, O.F.M. 26. 1-2 Maccabees, Neil J. McEleney, C.S.P. 27. Introduction to Wisdom Literature, Roland E. Murphy, O.Carm. 28. Proverbs, Thomas P. McCreesh, O.P. 29. Canticle of Canticles, Roland E. Murphy, O.Carm. 30. Job, R. A. F. MacKenzie, S.J. ; Roland E. Murphy, O.Carm. 31. Ecclesiastes (Qoheleth), Addison G. Wright, S.S.
32. Sirach, Alexander A. Di Lella, O.F.M. 33. Wisdom, Addison G. Wright, S.S.
34. Psalms, John S. Kselman, S.S.; Michael L. Barré, S.S.
35. Ruth, Alice L. Laffey. 36. Lamentations, Michael D. Guinan, O.F.M. 37. Baruch, Aloysius Fitzgerald, F.S.C. 38. Tobit, Judith, Esther, Irene Nowell, O.S.B. ; Toni Craven; Demetrius Dumm, O.S.B. 39. Jonah, Anthony R. Ceresko, O.S.F.S. II. THE NEW TESTAMENT AND TOPICAL ARTICLES. 40. Synoptic Problem, Frans Neirynck. 41. The Gospel According to Mark, Daniel J. Harrington, S.J. 42. The Gospel According to Matthew. Benedict T. Viviano, O.P. 43. The Gospel According to Luke, Robert J. Karris, O.F.M. 44. Acts of the Apostles, Richard J. Dillon. 45. Introduction to the New Testament Epistles, Joseph A. Fitzmyer, S.J. 46. The First Letter to the Thessalonians, Raymond F. Collins. 47. The Letter to the Galatians, Joseph A. Fitzmyer, S.J. 48. The Letter to the Philippians, Brendan Byrne, S.J. 49. The First Letter to the Corinthians, Jerome Murphy-O'Connor, O.P. 50. The Second Letter to the Corinthians, Jerome Murphy-O'Connor, O.P. 51. The Letter to the Romans, Joseph A. Fitzmyer, S.J. 52. The Letter to Philemon, Joseph A. Fitzmyer, S.J. 53. The Second Letter to the Thessalonians, Charles Homer Giblin, S.J. 54. The Letter to the Colossians, Maurya P. Horgan. 55. The Letter to the Ephesians, Paul J. Kobelski. 56. The Pastoral Letters, Robert A. Wild, S.J. 57. The First Epistle of Peter, William J. Dalton, S.J. 58. The Epistle of James, Thomas W. Leahy, S.J. 59. The Epistle of Jude, Jerome H. Neyrey, S.J. 60. The Epistle to the Hebrews, Myles M. Bourke. 61. The Gospel According to John, Pheme Perkins. 62. The Johannine Epistles, Pheme Perkins. 63. The Apocalypse (Revelation), Adela Yarbro Collins. 64. The Second Epistle of Peter, Jerome H. Neyrey, S.J. 65. Inspiration, Raymond F. Collins. 66. Canonicity, Raymond E. Brown, S.S.; Raymond F. Collins. 67. Apocrypha: Dead Sea Scrolls; Other Jewish Literature, Raymond E. Brown, S.S.; Pheme Perkins; Anthony J. Saldarini. 68. Text and Versions, Raymond E. Brown S.S.; D.W. Johnson, S.J. ; Kevin G. O'Connell, S.J. 69. Modern Old Testament Criticism, Alexa Suelzer, S.P. ; John S. Kselman, S.S.
70. Modern New Testament Criticism, John S. Kselman S.S.; Ronald D. Witherup, S.S.
71. Hermeneutics, Raymond E. Brown S.S.; Sandra M. Schneiders, I.H.M. 72. Church Pronouncements, Raymond E. Brown S.S.; Thomas Aquinas Collins, O.P. 73. Biblical Geography, Raymond E. Brown S.S.; Robert North, S.J. 74. Biblical Archaeology, Robert North, S.J. ; Philip J. King. 75. A History of Israel, Addison G. Wright, S.S.; Roland E. Murphy, O.Carm. ; Joseph A. Fitzmyer, S.J. 76. Religious Institutions of Israel, John J. Castelot; Aelred Cody, O.S.B. 77. Aspects of Old Testament Thought, John L. McKenzie. 78. Jesus, John P. Meier. 79. Paul, Joseph A. Fitzmyer, S.J. 80. Early Church, Raymond E. Brown S.S.; Carolyn Osiek, R.S.C.J. ; Pheme Perkins. 81. Aspects of New Testament Thought, Raymond E. Brown, S.S.; John R. Donahue, S.J. ; Donald Senior, C.P. ; Adela Yarbro Collins. 82. Pauline Theology, Joseph A. Fitzmyer, S.J. 83. Johannine Theology, Francis J. Moloney, S.D.B.